"Making Tennis Matter: A USTA Southern Facility Toolkit." USTA Southern is a not-for profit business that was founded in 1886 and is focused on the development and promotion of tennis within the 9 states comprising the USTA Southern Section. It is one of 17 sectional associations that make up the USTA, the National Governing Body of tennis in the US. The mission of USTA Southern is to promote and develop the growth of tennis. USTA Southern is looking to provide assistance with tennis court construction and reconstruction. We recognize that more top quality facilities throughout USTA Southern will be beneficial in our efforts to increase the number of people playing and enjoying tennis in their community. The goal of USTA Southern is to support a portion of the costs of the construction of new facilities and those that would benefit from reconstruction to successfully attract and retain new tennis players. We have budgeted $500,000 and our focus is to primarily help public construction efforts. Providers must first complete the USTA Facilities Assistance Grant and complete that process prior to being considered. To review the process, please click here. 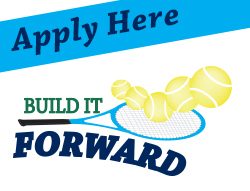 USTA Southern will decide on your Build It Forward application after USTA makes a decision on your application. Rejection by the USTA does not mean the project won’t be considered by USTA Southern’s Build It Forward program. Facility projects which have already started construction can still be considered if the request is to “add-on” to an existing construction project. For example, a project which is in Phase I of construction, but presents a request for funding of an additional 16 court construction “add-on”, a Phase II, is made. In this example the project team would consider the request. Each grant will have a cap depending upon which category you are in, for resurfacing, reconstruction or new facilities. In order to leverage USTA Southern’s contribution, matching funds are preferred. Priority will be given to projects where there is participation by a State association, CTA or benevolent donors. Applications for grants can be submitted at any time and will be reviewed periodically until funds are exhausted. Funds will be disbursed after USTA Southern has completed a physical site inspection to confirm the correct completion of the project AND the USTA has completed its review. In cases where USTA Southern accepts a request and the USTA decides not to participate, payment will be distributed after USTA Southern has completed a physical site inspection to confirm the correct completion of the project. Payments will be made to the principle responsible for the project. With respect to the site inspection USTA Southern may ask USTA staff or volunteers, USTA Southern staff or volunteers and/or state staff or volunteers to verify the correct completion of a project. Cee Jai Jones, jones@sta.usta.com will be the contact point at Southern, and grant review meetings will be called by Cee Jai as needed to review the requests. The issuance of this grant application does not obligate USTA Southern to negotiate, enter into any contract, or to undertake any financial obligations related to the requirements referred to herein. USTA Southern reserves all rights, including without limitation the right to reject any proposal(s) received or to cancel the grant process at any time with no further obligation on the part of USTA Southern. USTA Southern will keep the proposals received confidential and shall have no obligation to disclose how proposals were assessed. Individuals and organizations applying must represent and warrant that, to the best of their knowledge, there are no potential individual or organizational conflicts of interest or potential conflicts of interest (e.g., current or past contractual or employment relationships between proposer and USTA, USTA Southern or any state tennis association) or other circumstances that might create a financial interest or arrangement in this transaction or between proposer and any USTA Southern Officer, Director, Committee Member, or employee or any state tennis association, state officer, state director, state committee member, or state employee. For the purposes of this disclosure only, “USTA Southern” includes USTA Southern and the Southern Tennis Foundation. If yes, please attach a detailed explanation. If no, please make an affirmative statement that you are unaware of any conflict or potential conflict. Prior to funds being disbursed by USTA Southern, applicants will be required to complete a Conflict of Interest Disclosure Form. Whether a disclosed conflict will disqualify a bidder from being awarded a contract, and all such decisions regarding the impact of any conflict(s) are necessarily dependent upon the facts of such conflict(s) and shall be made at USTA Southern’s sole discretion. Any questions should be submitted in e-mail format to Cee Jai Jones, jones@sta.usta.com. This Grant has been approved by the USTA Southern Board of Directors and the Southern Tennis Foundation Board of Trustees.